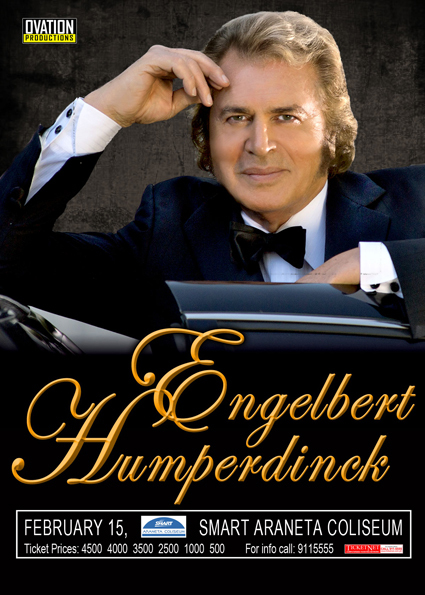 Engelbert Humperdinck Concert Live in Cebu and Manila will be on February 12 and February 14 and 15. The British Classic Pop Singer behind Quando Quando Quando will Serenade Filipinos in time for Valentine Season. Engelbert Humperdinck Concert Ticket Prices VIP - Php 4,755 ; PATRON (Reserved Seating) Php 4,225 ; LOWER BOX (Reserved Seating) Php 3,700 ; UPPER BOX A (Reserved Seating) Php 2, 640 ; UPPER BOX B Php 1,060 and GENERAL ADMISSION Ticket Price - Php 530. Engelbert Humperdinck Concert Live in Cebu and Manila is presented by Ovation Productions. Tickets for SMART Araneta Coliseum show are now available at all Ticketnet outlets. 0 comments: on "Engelbert Humperdinck Concert Cebu & Manila Live on February"